While I was out shooting one morning with Dad he brought up the issue of putting these planes into perspective as far as scale goes. If you have never experienced being around any of these aircraft, which I recommend everyone goes and sees them at some point, then it is hard to grasp the actual size of these planes. While some are quite small others are enormous. So how do we show this in a photograph? Well the easiest answer is finding something that everybody recognizes and stick it next to the plane. If you don’t have something then here’s another way. Everything looks bigger looking up at something. By getting down low you instantly make the subject larger. Now if you are working an airshow and have multiple planes around, then by simply having one in the background a size relationship is created. 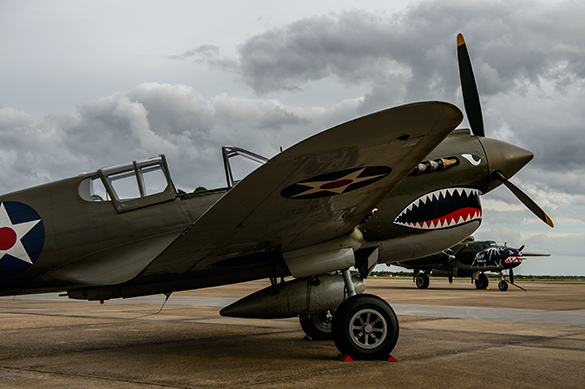 You can instantly make a small plane like the P-40, look bigger with a plane behind it. 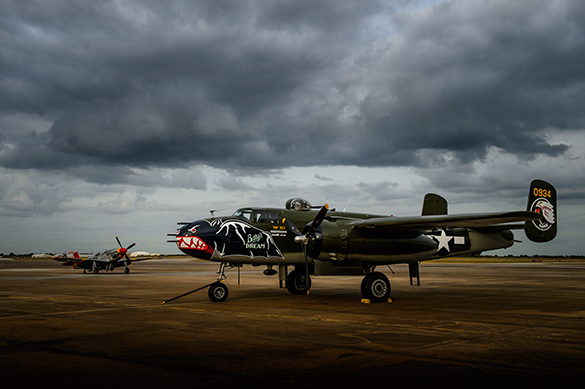 Or to reverse that, you can make a large plane, like this B-25J, look even bigger by making the P-51C Red Tail look dwarfed in the background. These simple compositions can add huge depth and scale to any photograph, you just have to use what’s around to make it happen.